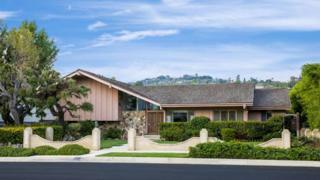 The Los Angeles house featured on the US sitcom The Brady Bunch has been bought by cable TV network HGTV, its parent company has announced. The network, which specialises in home improvement and gardening shows, will "restore the home to its 1970s glory", Discovery said. The property's exteriors were featured on every episode of the programme, which ran from 1969-74 in the US. Only the exterior of the house in Studio City appeared on the show. Indoor scenes were shot in a studio. The Brady Bunch was about a clean-cut family formed by the marriage of a widow with three children and a widower with three children. Pop star Lance Bass, who also bid for the home, congratulated the TV channel on Tuesday. The former NSYNC band member posted on social media on Saturday that he was "heartbroken" to learn his bid had been rejected. He had told fans he had bid "way over" the asking price of $1.88m (£1.45m) and planned to renovate the interior to make it resemble the set of the TV programme. After the buyer was revealed he changed his tune, saying he knew HGTV would do "the right thing". Maureen McCormick, who played Marcia Brady on the show, had tweeted at Bass with her congratulations over the weekend. Discovery's acquisition was announced by its chief executive David Zaslav during a quarterly profit call with investors. HGTV representatives later confirmed the sale to BBC News. "I'm excited to share that HGTV is the winning bidder and we'll restore the home to its 1970s glory as only HGTV can," he said. "More detail to come over the next few months but we'll bring all the resources to bear to tell safe, fun stories about this beloved piece of American TV history," he said. The house at 11222 Dilling St - less than two miles from the CBS studios - went on the market for the first time in 45 years just a few weeks ago. An advert said it was "the second-most photographed home in the United States" after the White House. The 12,500 sq ft lot, which has three bedrooms and three bathrooms, was built in 1959.